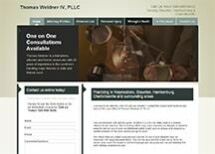 Thomas Weidner IV, PLLC, is passionate about protecting people’s rights in Fishersville, Virginia. We focus our practice on criminal defense and personal injury, and we are results-focused advocates who will work hard to find a solution that works for your particular situation. Our law office also services Staunton, Waynesboro and Augusta County. If you have been charged with a crime, or even a traffic violation, you need an experienced attorney who will give your case the attention it deserves. Our law office’s lead attorney, Mr. Thomas Weidner IV, is a former prosecutor, and he uses this background to dig into the details surrounding your charge. Mr. Weidner has over 22 years of experience in handling felony cases and has many established relationships within the criminal justice system. He will conduct his own investigation, examine all evidence, interview witnesses and help you find the best solution for your circumstances. Our compassionate team can help keep you focused on what is best for your future and that of your children. In matters concerning negligence, Thomas Weidner IV, PLLC, is not skittish about challenging large insurance companies to seek the maximum compensation you are entitled to by law. We are known for our attention to the small details of every case we handle, as well as for our proven record of success. Our law office accepts credit cards.